As the name would indicate, Imperial Casino will have you feeling like an emperor with their 3 different Loyalty Programs that award bonuses to loyal players. Their supportive staff caters to their customers with excellent service. As an added touch, the red and gold theme and dragon emblem give the casino an Asian flare. Imperial Casino gives players the royal treatment with its outstanding Loyalty Points Program and supportive staff. The gambling site delivers over 100 online casino games to over 200 countries. Their 3D games recreate the look and feel of playing at a real casino and come packed with cool themes and features. 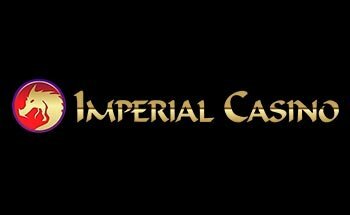 Powered by multiple software providers, the Imperial Casino offers over 100 popular casino games, with new ones on the way every month. Imperial Casino games come from Playtech, Ash Gaming, and Blueprint. 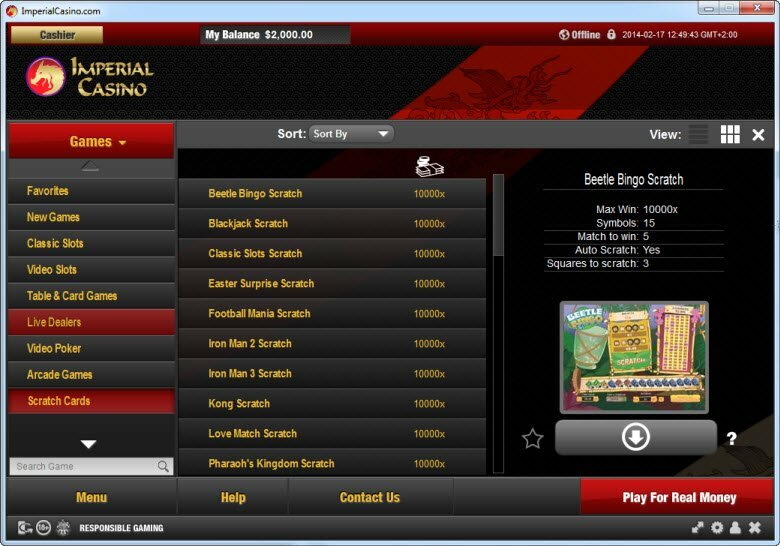 Options include online Slots, Roulette, Blackjack, Video Poker, Live Dealer, Scratch Cards, and more. They have an especially great choice of Slot Machines which include favorites like Iron Man, The Incredible Hulk, The Sopranos, and a Marilyn Monroe Slot. Imperial Casino Slots have paylines ranging from one to over 1,000. The Casino even has a Favorites section so gamblers can quickly return to their most frequently played Game. Imperial Casino goes above and beyond to ensure their loyal customers receive the royal treatment by offering three different Loyalty Rewards programs. Imperial Casino goes above and beyond to ensure their loyal customers receive the royal treatment by offering three different Loyalty Rewards programs. The VIP Dragon Club lets players redeem prizes by earning “Dragon Points” while playing. Imperial Casino awards elite prizes for those participating in their VIP Dragon Club or VIP Dragon Club Platinum Rewards Program. These represent great options by providing benefits to Casino players who play often and/or for high stakes. Aside from their phenomenal awards programs, Imperial Casino also runs Promotions on over 50 of their Slot Machines covering a variety of themes. Players who take advantage of the Imperial Casino Bonuses may receive Free Spins, Multipliers, Multi-Level Bonus Rounds, or cash in big on Progressive Jackpots. 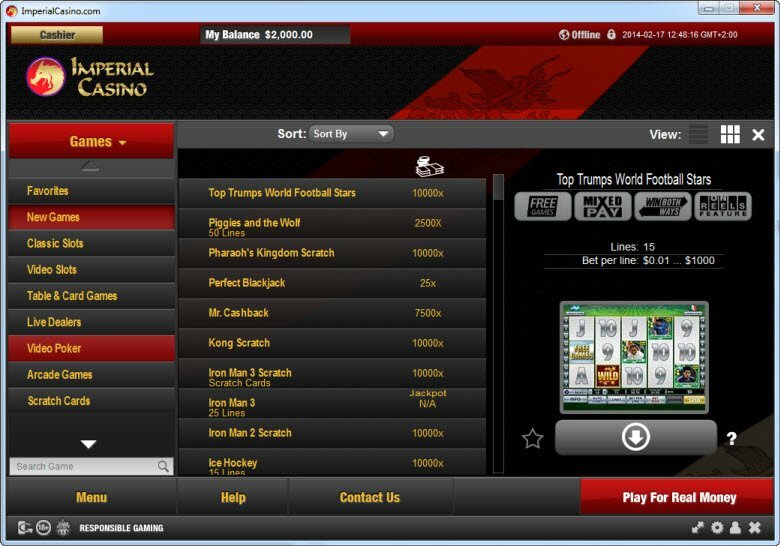 Imperial Casino accepts most of the major players in terms of online banking. Gamblers playing for real money can rest assured that their payments will transfer safely and securely using companies such as Visa, Skrill Moneybookers, Neteller, Mastercards, and more. So maybe you’ve never played at Imperial Casino before or you experience a technical difficulty while playing your favorite Slot Machine. Imperial Casino offers a supportive staff standing by to help. Should you run into trouble along the way, shoot them an email or send a staff member a message via Life Chat support. New players can learn how to get started with their user friendly instructions.